Teenage Mutant Ninja Turtles UNO Card Game - Low Price! 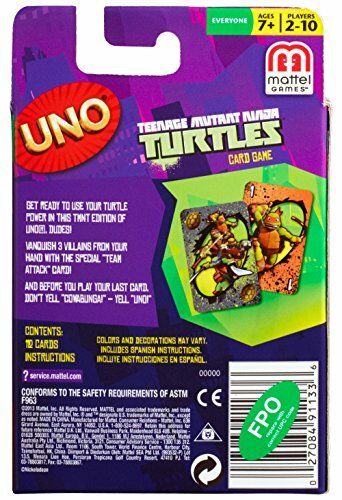 Home Amazon Teenage Mutant Ninja Turtles UNO Card Game – Low Price! Teenage Mutant Ninja Turtles UNO Card Game – Low Price! We found a hot deal on a Teenage Mutant Ninja Turtles UNO Card Game on Amazon! Hurry and get the Teenage Mutant Ninja Turtles UNO Card Game today for only $4.99 from Amazon! Buy now for get well gifts or stocking stuffers! Check out all of the Amazon deals here! Amazon Prime members get FREE 2-day shipping!! If you are not a Prime member, get FREE shipping when you purchase $25 or more of eligible items across any product category. Check out the Teenage Mutant Ninja Turtles UNO Card Game details below. Cowabunga! It’s the Teenage Mutant Ninja Turtle (TMNT) version of UNO! Get ready to unleash your turtle power in this Teenage Mutant Ninja Turtle (TMNT) version of UNO, dudes! Classic UNO rules apply, yet with the addition of a special rule and 4 corresponding action cards, players get the chance to experience all new game changing moments! This fearsome foursome of turtles works together with the Team Attack Card, which allows players to vanquish 3 villains from their hand! Fans of the cartoon series and movie will recognize their favorite characters, like Leonardo and Michelangelo, who are featured on the cards they play. And do not forget to yell “UNO” when you have but one card remaining! Includes 112 cards and instructions. Buy the Teenage Mutant Ninja Turtles UNO Card Game from Amazon.